A half-seen wolf is either condensing into or evaporating out of this dimension. She sips water from a pool cradled by cacti and succulents. A glow of larger orbs concentrates in the left top corner, possibly coming from the prominently silver highlighted succulent. Night blossoms are blooming in the soft moonlight. A foggy hillside of small peaks are seen in the distant background. There is loose symmetry in both the vertical and horizontal axes—between the wolf and her reflection, between the plants from left to right. But symmetry of this kind is very unusual in nature, so the scene is stylized to be both unreal and surreal, spontaneous yet composed. Multiple light sources imply that in addition to moonlight, the dancing orbs and the wolf apparition itself are illuminating the scene. To me, this painting is about making the viewer feel safe to contemplate vulnerability. 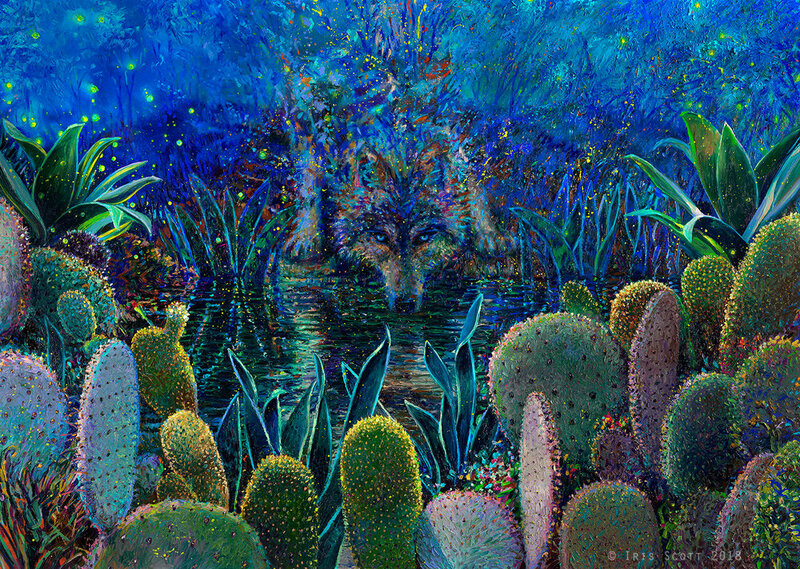 I want to say, “Do not be afraid: you are well fortified—there is a moat and a wall of thorns between you and this vision.” The wolf is menacing, but her colors are intentionally reassuring, bathing the viewer in blue green calm. It’s a way of embedding beauty and serenity into something we normally associate with distress. It is unclear whether the wolf’s particles are dissipating or coming into existence. The blossoms and leaves almost seem to be puffing out glowing seeds that materialize the wolf…if you look closely, the apparition is being sourced from a plant. This is my salute to plants with psychedelic properties. There is a cyclical nature to this piece—something so wonderful that it both invites and creates distance. If you are afraid of this wolf it will appear, manifested by fear. But if you gaze with love, the peaceful wolf would scatter into a beautiful memory. Am I going to be afraid or am I going to fall in love with the wolf? This is the cusp, the choice point between fear and love.